It's a mystery card - Check out insert TCH 69, it's missing both the players name and also the facsimile autograph. 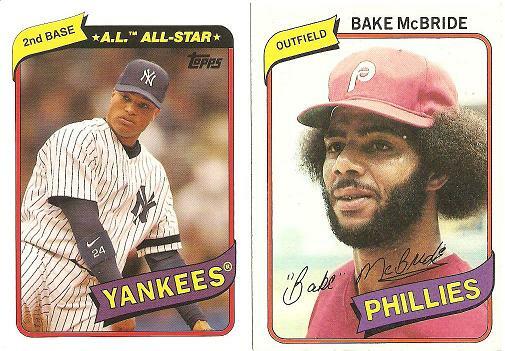 Another great job by the topps crew - although this gives me the opportunity to post this excellent 1980 card of the Phillies fine right fielder Bake McBride. Phils take 2 of 3 crazy games from the Braves. All the games were tight late - The Braves scored 7 in the top of the 9th on Friday to blow open what was a 1-0 nailbiter. But Phils put together a pair of big comebacks on Saturday and Sunday to win the series. Plus - Two comeback wins. The offense finally shows up. Minus - The Phils defense lets down Cole Hamels as he throws in a clunker, giving up 9 runs over 3 2/3 innings. Philadelphia Daily News is reporting that Chase Utley has a nagging hip injury. Meh - Philadelphia Soul win the Arena Bowl. On Deck - The woeful Washington Nationals. The Nats seem to always play the Phils tough, regardless it's time for the Phils to rack up some wins against the bottom of the Division. Team Phungo will be paying a visit to Nationals Stadium on Thursday for the 3rd game of the set. Scoop - Phillies Nation is reporting that J A Happ was removed in the 3rd inning of Sunday game. Sounds like he may be a trade chip. Lopes has made Shane Victorino into a great base-stealer. When Victorino first came to the Phils (a two time rule 5) he was pretty raw and didn't know how to use his speed - now he is a constant threat and rarely gets caught. The picture below is from the All-Star Celebrity Softball game held at Yankee Stadium a couple of weeks ago. I think that is Goose on the mound. 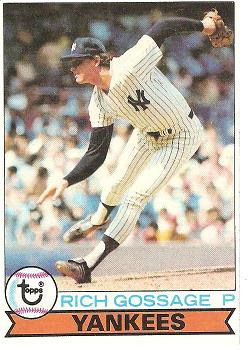 I was also lucky enough to see Gossage pitch in a real game in 1978. He actually blew a save in the game, but Graig Nettles bailed him out giving Goose the victory. I don't remember much about the game other than that they had to stop play twice due light failures in old Memorial Stadium. The Phils- Mets duel for first place ends with the Mets on top and the 2007 NL MVP not wanting to play baseball. Plus - Once again Jamie Moyer - not just for his fine outing Thursday, but also for being the one guy in the clubhouse to mention that maybe the players should be accountable and responsible. Minus - Take away the big 9th inning on Tuesday night and the Phils scored 6 runs in the series. Chase Utley OPS last two weeks is .658 (.750 is an accepted ML avg). Joe Blanton comes up small in Phils debut. Shenanigans - Does Jimmy Rollins want out of Philadelphia? BlogBlogBlog - Wax Heavan has a great post regarding players and autograph seekers at last sundays Phils @ Marlins game. Off the Diamond - The University of Texas is retiring the jersey number of Kevin Durant (#35). As great a college player as Durant was, how ridiculous is it to retire the number of a player that spent 1 year at the school. On Deck - Phils come home for the first time since the break and host the Atlanta Braves. The Phungo team may trekking down to the ballpark for the game. On Tuesday Stefan Fatsis returned to Philadelphia to read from his new book "A Few Seconds of Panic", a piece of particapatory journalism (similar to George Plimpton's "Paper Lion") chronicling Fatsis' attempt to become a Field Goal kicker for the 2006 Denver Broncos. Fatsis was great - having graduated from U Penn, he saluted Philadelphia as his second home. He then followed up with some background on the book and dove into reading a passage about his first day on the practice field. Afterward Fatsis illuminated the excerpt by mentioning the training he had gone through prior to camp. Ultimately he felt that his effort paid off as he believes the players accepted him as more of a player than as a reporter. I was fortunate to get Fatsis to sign not only "A Few Seconds of Panic" but also copies of his previous books drawn from my collection. His first book was a terrific book on the non-affiliated Northern League "Wild and Outside" - a great read for any baseball fan - and Fatsis seemed genuinely delighted that someone had brought a copy to his reading/signing. Fatsis was thoroughly entertaining and gracious throughout the reading and signing. I am looking forward to kicking off football season by reading his new book. Since the Phils are in New York this week I will try and post some pictures taken while visiting the city for the Futures game last weekend. These photos didn't come out as clear as I would have liked - It was the day of the Home Run Derby, consequently it was pretty busy. Those are all real cards there and they are all Yankees cards - It looks pretty cool. The top inset photo is of Babe's Left Eye (the right one in the mosaic). The last picture is a close-up of the left-hand side of the mosaic. Phils drop 2 of 3 to the Marlins including losing the rubber match in extras. In the 7th inning Jimmy Rollins was on first with two outs and failed to score on a Shane Victorino double. Rollins definitely was not running when the ball was hit and it's questionable that he would have scored - but you have to be running when that ball is hit and give yourself a chance to score. This is the second time this has happened to Rollins this year, and yes it happens to other players but....Rollins is 1) to good a player to let it happen to him and 2) an important leader on the Phillies team and the Phillies need him to display leadership qualities. Plus - Way back on Friday night Jamie Moyer came out of the break with another good outing. Ryan Howard has picked up where he left off before the break, and continues to hit well. Minus - J-Roll - read paragraph 1. Geoff Jenkins can't even break a bat right - he had to be removed from the game on Sunday as he injured himself by getting hit by his own broken bat swing. Phils waste yet another good outing by Cole Hamels. Around the League - Extra Innings is offering it's mid-season free preview. We are not offered the package on my FiOS service, but I was fortunate enough to be in a pub that carried a couple of games Saturday night. The O's hosted the Tigers in a pretty crazy game while the D-Backs held off the Dodgers preserving a W for my newest fantasy pitcher Dan Haren. Off the field - The Philadelphia Flyers Schedule came out this week. The schedule starts off with a nice match up v the Rangers. Both the Pens and Caps bring in there superstars on Saturday nights in December and There is a Home and Home with the Hurricanes over Thanksgiving - of which the back-end is a day gm on the Friday of the wkend. Those are some of the highlights of the early season. For those interesting in good winter travel the Flyers head to southern California to play the Ducks and Kings right after New Years. Oh and congrats to Greg Norman - may not have been a W on Sunday, but he showed that there is such a thing as golf without Tiger - just like there will be foorball without Brett. Scoop - Ran into some family of Marlins minor league prospect Sean West over the weekend. I didn't know anything about West but did look up his info via Baseball America. He is a big Lefty (6'8") playing at AA. Sean's aunt and uncle were very nice folks and I hope for the best for him...just not against the Phils. They said they would like to see him get a shot at playing in the majors this September. On Deck - Meet the Mets. Mets were just getting hot when they were in town a couple of weeks ago, now the Phils get to face the red hot Mets for 3 games with first place on the line. Monday Night Joe Blanton will get his first career Phils start v Mets Ace Johan Santana. I always thought that action hero movies really weren't my thing, but it seems I do see a lot of them. Batman has always been the most interesting of the superhero stories to me, and for the most part I have enjoyed whatever incarnations of Batman I have seen - TVs Adam West, Tim Burton, and Batman Begins. I found Dark Knight, while pretty grim and dark, to still be a fun ride and that was occasionally confusing. There were many layers of betrayal and the never-ending endings. I expected more of the highly doubted movie, but I still give "Dark Knight" a thumbs up. Lots of action and I did not find the CGI affects overwhelming as often happens in the new actions films. Temps were in the Hi 90s all day across the mid-atlantic -very good day to take in a flick. Movie conflicted w/ Saturdays Phils game which turned out being quite painful from what I understand. "Small" soda ran $4.50 @ the movies. .
"The Dark Knight" seemed to be pretty violent, and carry some pretty heavy themes for PG-13. There has been a lot of excitement about Heath Ledger's performance in "The Dark Knight". Curiosity will always surrounds those who die very young (or very old) and this obviously influences ones perception of the actor and the part. I bought Ledger as the Joker, but I was not overwhelmed by the performance. The top teams in the NL Central get CC Sabathia and Rich Harden. The Phillies Get Joe Blanton? I can't get excited about this deal. In general Pitchers from the AL can expect to do better in the NL because of the no-DH, however Oakland is a huge park which benefits pitchers. I have grave concerns about Blanton's transfer to Citizen's Bank. And what does this have to do with Gio Gonzalez. It seems like the Phils can't get away from this guy. First It comes over to the Phils in a deal that leaves the Phillies paying 7M dollars a year to hit home runs for the Chicago White Sox. 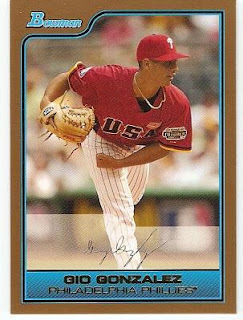 Then he ends up being half of a deal back to the Chisox so the Phils can pay Freddy Garcia 10M to mend a busted arm - How much better would the Phils look right now with Floyd and Gonzalez in-house? Now the A's have to make room for Gio to start so they somehow get 2 prospects out of the Phils for a #3 or #4 starter. The World team captured the 2008 All-Star Futures game by a 3-0 score. Nine pitchers combined to shutout the USA Squad on only 3 hits. Che-Hsuan Lin, a Low-A Bosox prospect, from Taiwan captured the MVP trophy for the game by collecting two hits including a 2-run Homer into the left field seats. A's farmhand Henry Rodriguez (Hi-A) also excited the crowd by firing several pitches in the Hi 90s and topping out with a handful at 100 MPH. Plus - The oft-questioned Phils minor league system, sent 4 prospects to the futures game. Carlos Carrasco playing in his third futures game earned the W for the world team pitching a scoreless first where he struck out 2 and got a broken bat grounder to retire all three batters he faced. One of the three US hits was by Jason Donald. The game was attended by an estimated 20,000. This was so few that we were able to sit in section 7 behind home plate. Minus - Of course I paid the full price of $75 for my tickets instead of the $20 I could have easily gotten away with. Hopefully the performance of Team USA is not indicative of what they will do in Beijing. According to the NY Daily News only two of the world players were expected to represent their native countries in the Olympic games. Shenanigans - According to Topps Ryan Howard is an "Own the Game" caliber player, unfortunately he does not own enough of it to make the All-Star team. This is despite the fact that he leads the league in both Homers and RBIs. To find the last RBI/HR leader at the break to be a non-star you have to go clear back to Hank Sauer in 1948. BlogBlogBlog - Baseball America is always a good place for Futures Game Coverage. BlahBlahBlah - Apparently Jim Leyritz is bent out of shape about not being formally invited to participate in All-Star festivities. Not sure if DUI related manslaughter charges have anything to do with the Yankees oversight. Off the Diamond - Team Phungo stuck around for the first inning of the celebrity softball game. Wade Boggs Homered in the first AB for the AL/Yankees squad. This was my third and most likely final trip to Yankee Stadium. I am not a Yankees fan and did not go to enough games for the stadium to have any particular memories for me, but I did enjoy the handful of trips I made to the House that Ruth Built. Scoop - According to a Phungo source Pat Gillick was spotted at the Futures Game sitting w/ Yankees GM Brian Cashman. Useless Info - Spotted hungry autograph hounds outside of the Inter-continental @ 48th & Lexington. On Deck - Next game on the team Phungo slate is a Phillies road game @ DC scheduled for 7/31, but I would think we will try and squeeze in a game or two between now and then. Phils win second series in a row, picking up a couple of good wins both Friday in extra-innings and Sunday by getting some late Herolics from Pat Burrell. 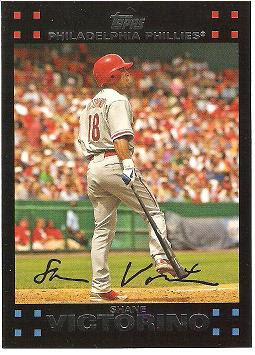 Plus - Shane Victorino had been pretty quiet before having a good wkend at the plate. Minus - The 07 version of Adam Eaton has showed up in both the form of Adam Eaton and Brett Myers. Still no run support for Cole Hamels. Shenanigans - Ryan Howard, first player since Hank Sauer (1948) to lead the league in HRs and RBIs at the break and not get into the Mid-Summer Classic. BlogBlogBlog - So Taguchi scored winning run on Friday night in a rare bright spot for his rather dismal season. G. W. Miller recently penned this feature story on Taguchi for the local Alt-paper PhillyWeekly. Around the League - Mets En Fuego - Phils needed the break not just for themselves but also to cool down those suddenly on Fire Mets. Mets gave up a grand total of 1 run v the Rockies this wkend and 4 in their last two series, including 4 stinkin shoutouts. Mike Pelfrey looked pretty sharp on Sunday night. The light may have come on for this youngster - real bad omen for the Phils. On Deck - Division Rival Florida Marlin. Phils are electing to give Cole Hamels extra rest and have scheduled Jamie Moyer for first game after the break. This means if the Phils don't go with a 4 man rotation for the first couple of weeks after the break that Hamels will not get into the series against the Mets in New York. The Mets are will face the Cincinnati Reds after the break. Getting up early and going to work @ painfully early hours finally paid off as Team Phungo was lucky enough to win a contest run by the good folks over at Cardboard Junkie headquarters. Dayf was also generous enough to send not just the shiny Chrome Prizes but throw in a couple of additional Phillies cards. I have posted the back of the Mantle card which notes that Jim Kaat was Mantle's victim for his 470th dinger. I also posted some of the highlights from the bonus cards sent. Good contest, Great cards! The Chrome's included a Jeter and first time all-star Geovany Soto. Obviously the Richie Ashburn 01 Topps Archive would make any Phils Phan Giddy, and there were bunches of fun cards including Pat Burrell's Goudey Card, Heritage cards of both Burrell and Gavin Floyd, and some older cards of Jerry Koosman, Warren Brusstar, and George Vukovich. There were a couple of other base cards and prospects mixed in spanning several different card issues - A perfect cross-section of cards. Well Done. Thanks to Dayf and keep up the Good Work! Phils take the series from the Cardinals 2-1 behind strong pitching and enough hitting. If my count is accurate the Phils have won series vs teams with winning records - Cubs early in the year, Marlins, and now the Cards. Plus - Great pitching from the Ace, the Rookie, and the Veteran. Ryan Howard is starting to come around - most likely since I just traded him off my fantasy squad. Minus - Rest of the offense continues to be extremely quiet. Jimmy Rollins has reaverted to the non-base machine that he was a few years ago. So much so one has to wonder if 2007 was the exception. Shenanigans - Pat Burrell - Is there any other player with 240 home runs at the age of 31 to not make a single all star game? BlogBlogBlog - Recently became a Steve Wynn fan - Insterested to find out more about this album. Off the Diamond - Had Jury duty this past week, as part of your compensation they pay you mileage of 17 cents per mile - What the F year is that from. just to break even you need to get like 30 mi/gallon. And how comes the courthouse has fancy flatscreen TVs and I don't? On Deck - Arizona D-Backs. Randy Johson comes to Philadelphia for possibly the last time - marquis Webb-Hamels matchup on Sunday. D-Backs have fared poorly on the road (-9). Hopefully that continues. Like the Phils, Arizona has struggled in the last month. Yahtzee - Last week I was fortunate enough to win a contest sponsered by the Cardboard Junkie crew. The cards came in on Thursday and Dayf was also good enough to thow in some Phils cards as a bonus. Look for a posting on this in the near future. Perennial Cy Young Candidate Joel Pineiro tosses a shutout vs Phils Vaunted Offense. It may be the Phungo Curse. The Phungo team has been to 3 Hamels' games this season and The Phils have been shutout in two of them. Plus - Game finished in a brisk 2:21. I was actually home shortly after 10. Minus - Remember y-day note about not scoring in the first 5 frames. Phils now up to (or should I say standing at) 4 runs in those beginning frames through the last 5 games. It may not be like falling 7 games in 17 days but since the Phils 20-2 outburst v the Cards on Friday the 13th of June, The Mets have picked up 6 games on the Phils. Shenanigans - What does a genius like Tony LaRussa do during BP? Carefully examine hitters? No. Run precision field Drills? No. Work on the finer points of the game with a younger player? No. The answer is......The Genius Putts. Yes, during BP Tony LaRussa helped manage his team by golfing baseballs towards the collection bucket at second base. Meh - got a look at the new all-star jerseys. basically they look like the Yankees away jerseys. Useless Info - Phils sell out streak did end at 13. Still a good crowd for a hot Tuesday night. On Deck - The Futures Game @ Yankee Stadium. Looking forward to the game and the weekend in New York. Phils and Mets square off in a four game series over the Midsummer July 4th holiday. The Phils steal the first game as rookie J A Happ pitches well in his 2nd career start as the Phils defeat two time Cy Young award winner Johan Santana. After that the Phils drop 3 in a row propelling the Mets back into the NL East race. Plus - Phils show some fight on Monday night, getting back into a gm they were losing 10-1. Phils get a W v Santana. Minus - During the 4 game series the Phils only led for 1/3 of an inning - The only led in game 1 when they won the game. In the first five innings they scored a combined 4 runs in the 4 games. Phils have now lost 7 of 8 series dating back to 6/10 series v Marlin. . Shenanigans - I thought the over-ruling on Howard's Homer Mon night was incorrect. It appeared to me that the ball would fall in play had there been no interference. However, on Baseball Tonight, I caught the angle from the Mets feed and from that angle it looked like there was a case for the HR. The crew on ESPN agreed with the call. BlahBlahBlah - 3 of the four games were tight and either went extras or came down to the final at-bat. Phils have won a lot of these games this year, perhaps this series just catching up with them. Useless Info - Phils have sold out 13 games in a row. I would think it likely that the streak will end tonight. On Deck - Cardinals @ Phils, 3 game series. Phillies scored 20 in first of a 3 game set v Red Birds last month, then dropped the final game of the series. The Phungo crew will be at the Tuesday 6/8 game - Pineiro v Hamels. Punchless Phils get nothing off of journeyman Oliver Perez as they drop another game to the Mets. Phils finally tie game on Jayson Werth's 2 Run dinger in the 9th, only to lose the game in the 12th on a Fernado Tatis Homer. Kyle Kendrick doesn't pitch great, but manages to get himself out of some jams. Jayson Werth homers with 2 outs in the 9th off Billy Wagner ruining yet another save opportunity for the former Phil. Team Phungo gets drenched not at game but on way out of game. I just couldn't wait out the three hour delay and called it a day about an hour after the game had been suspended. Phils "vaunted" offense doesn't get an extra base hit all day other than the Werth Homer. Phils have come up with 3 XBH during the entire 30 innings of the Mets series. Tom Gordon heading to the DL, bullpen starting to show some wear. Brew Crew on a Roll on and off the field. Milwaukee already has the 2nd best record in the NL, and now they most likely have the best pitcher who will get moved during the season. Philadelpia Soul win a playoff game on botched call at the end of regulation. How comes the only time a call goes Philadelphia teams way its for a team that doesn't count. There was the obligatory rain delay field crasher yesterday. He eluded Phillies security by jumping into the Tarp tube roller. Of course he had nowhere to go and was handcuffed at the opposite end. 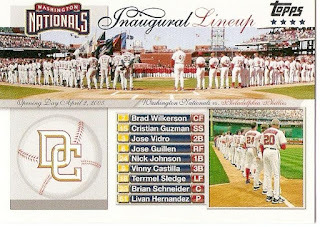 Posting a Nationals card for the 4th of July. An error on the card is they got the stinkin date wrong. The game as can be seen on the Phungo banner was April 4 2005. Not sure where Topps got the 4/2 date from. According to Baseball-Reference.com There weren't any MLB games at all that day. And of course for the inaugural season @ the Nationals new ballpark in DC, nobody associated with MLB had the good sense to schedule a home game for the Nats. Instead the Nats are visiting the Reds. I am guessing this is because the traditional home opener has been stolen from Cincinnati and this year took place in Washington. Phils return to Atlanta and sweep the Braves on the road for the second time this season. Plus - Phils back on track? Utley and Howard appear to be hitting better, No Brett Myers to kick around for a little while. Could the Braves be in panic mode? BlahBlahBlah - Something going on with Brett Favre? Around the League - The Obvious Story is the Devil-Rs - watched them stick it to the Bosox in the 7th on Wednesday night. Hopefully the Tampa fans get on the bandwagon down there. Orioles defeat Royals 7-5 behind a quality start by Rookie Rhadames Liz and a big four run 3rd inning. Plus - First Trip to Camden Yards for 08, Night out w/ crime partner Stove. Free T-Shirt George Sherill - Closer. Sherill is one of a bunch of players the O's received for Erik Bedard. So far the trade has worked out very well for the O's who have also gotten contributions from CF Adam Jones (the Baseball one, not the one formerly known as PacMan). O's not drawing real well so we moved down to the rich people seats in about the 5th inning. Shenanigans - Ran out of Free T-Shirts before I got mine. Meh - $44 night - 15 ticket, 11 for two beers, 8 Parking, 10 food. BlahBlahBlah - Brett Myers gets sent to AAA - hope the young ladies in the Lehigh Valley have been brushing up on their kickboxing classes. Around the League - Good night for scoreboard watching, one because they have nice new scoreboards at Camden Yards and two, because the Phils Won and the Marlin lost. Phils lead is now 1.5 games. Off the Diamond - As an homage to A-Rod/Madonna 'news" local sports radio station starts faux rumour regarding Charlie Manuel and Amy Winehouse - love it. Useless Info - In Phungo Games Mark Grudzielanek has appeared for 5 different teams (Expos, Dodgers, Cubs, Cards, and now the Royals). On Deck - The Next Phungo Game is scheduled for Sunday 7/6 as the Phillies host the New York Mets. Probables Odalis Perez v Kyle Kendrick.